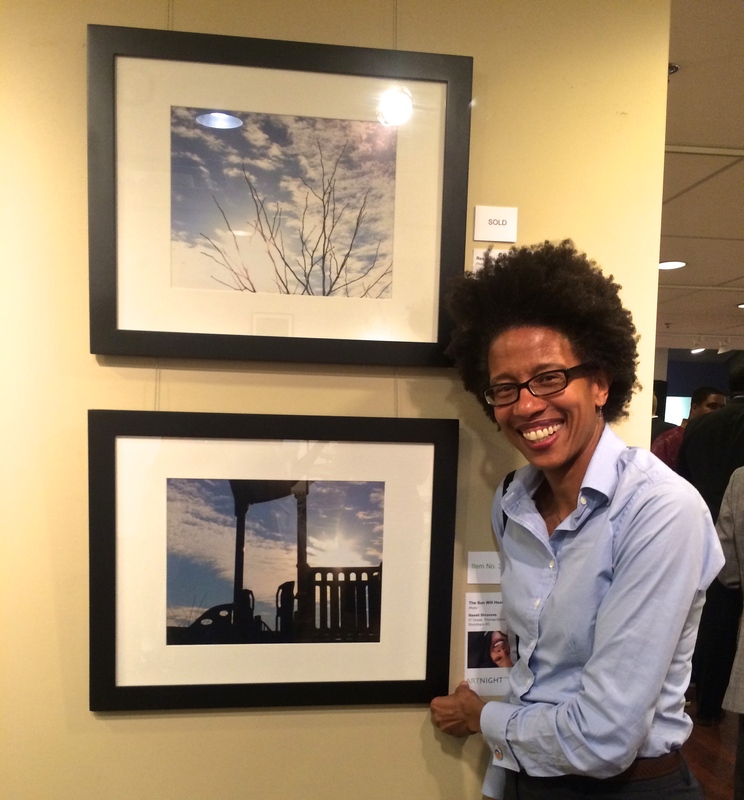 Traci Higgins showcases her newly purchased work of art – an original photograph by Shootback photographer Navell Shreeves, a third-grader at Thomas Elementary School in Washington, DC. 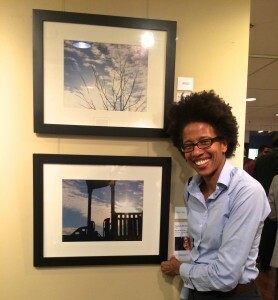 Four young Shootback photographers from Thomas Elementary School and three students from Ballou High School had their photographs selected for the DC Public Education Fund’s Art Night 2014 exhibition and auction on Wednesday, May 14th at the Pepco Edison Place Gallery in Washington, DC. Over 50 pieces of artwork were auctioned off to raise funds for ArtsNowDC, a new initiative launched to support arts programs in DC Public Schools (DCPS). Shootback DC was an Arts Partner for the event. In partnership with Chancellor Kaya Henderson and DCPS, the ArtsNowDC intends to raise at least $100,000 to support arts programs in as many as 40 schools, with a focus on schools with the greatest need. The Art Night auction helped to raise over half of that goal. In the 2014-2015 school year, DCPS will ensure that every elementary and middle school student in the city has access to visual arts and music classes in their school. This commitment will give students exposure to the arts as a core component of the school day, and help provide DC youth with the resources to create and achieve. Shootback is proud to be a part of this important initiative and hopes to inspire and collaborate with more DC students to get their creative juices flowing! DC Public Education Fund is the independent nonprofit organization dedicated to accelerating innovation in DC Public Schools. Since its founding six years ago, DC Public Education Fund has invested nearly $80 million to support the development of quality teachers and leaders, engaged students and families in learning, and innovative classrooms and schools. No Replies to "Shootback Students’ Work Selected for DC’s Art Night 2014"